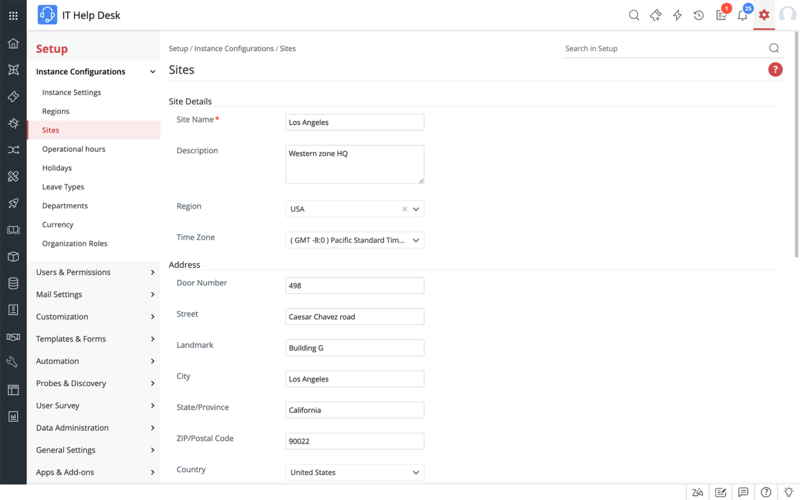 ManageEngine ServiceDesk Plus is a web-based help desk solution that allows you to create, manage and track all of your help desk incidents in one place. 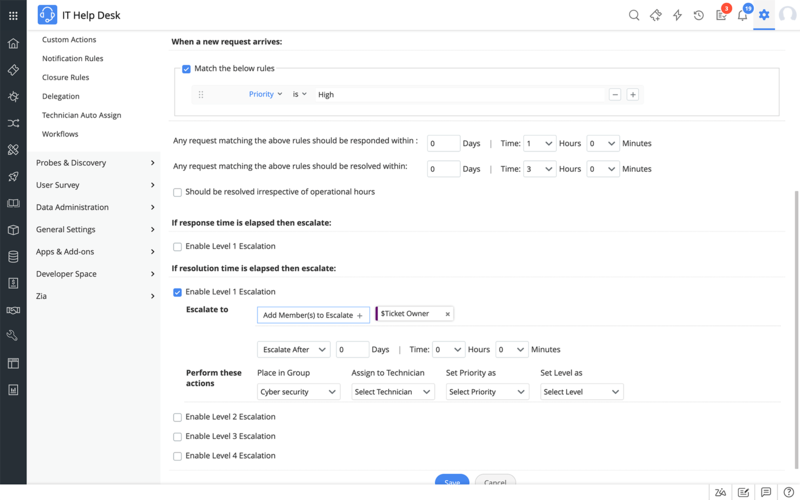 ServiceDesk Plus makes it easier than ever before to track incidents whether they come in through email or over the phone. This intuitive help desk solution is able to manage requests using a number of automated processes such as request routing, business rule application, SLA management and escalation management, to name a few. Easy to install, easy to implement and simple for users to access, ServiceDesk Plus is the only help desk solution you will ever need. For a help desk system to work well, it needs to be simple to update, simple to query and highly configurable. ServiceDesk Plus is all of those things and will help you to meet resolution targets and keep your users happy. 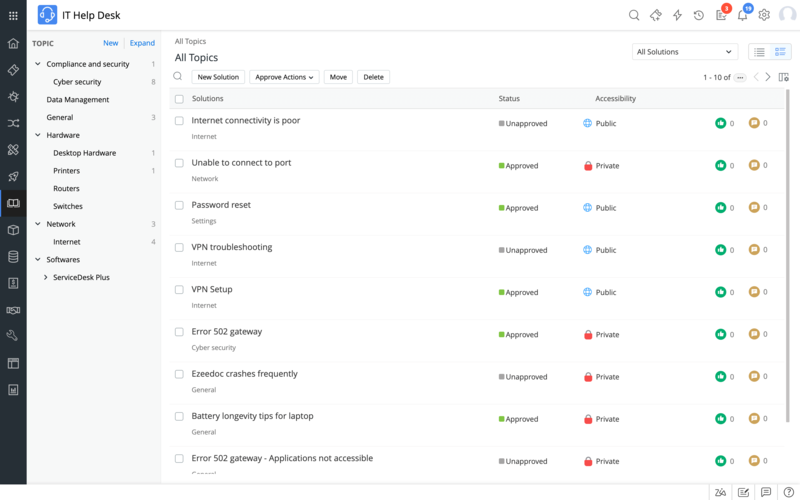 Wouldn't it be great if your users could raise their own incidents and track to status of those incidents? 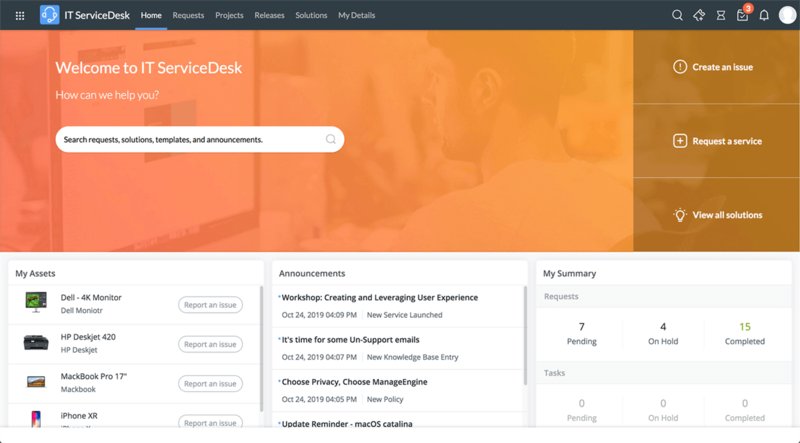 With ServiceDesk Plus self-service portal, they can. Users can even find the solution to their problem if it exists in your Knowledge Base. You can also make announcements about planned and unexpected outages using the self-service portal. Keep your users informed and proactive by populating your Knowledge Base with support resolutions on a regular basis. Not only will this help users to help themselves, but technicians can also use the Knowledge Base as a resolution repository. Stop copying and pasting from emails into new help desk incidents when ServiceDesk Plus can turn emails into incidents automatically. ServiceDesk Plus has multi-site functionality allowing you to provide 24/7 IT support across the different sites in your organisation regardless of geographical location. Service Level Agreements help to improve customer satisfaction through timely incident resolution. ServiceDesk Plus allows you to set up different escalation levels in your help desk software that will ensure incidents are prioritised correctly and dealt with according to their SLA status. Integrate your web-based help desk software seamlessly with any third party software. 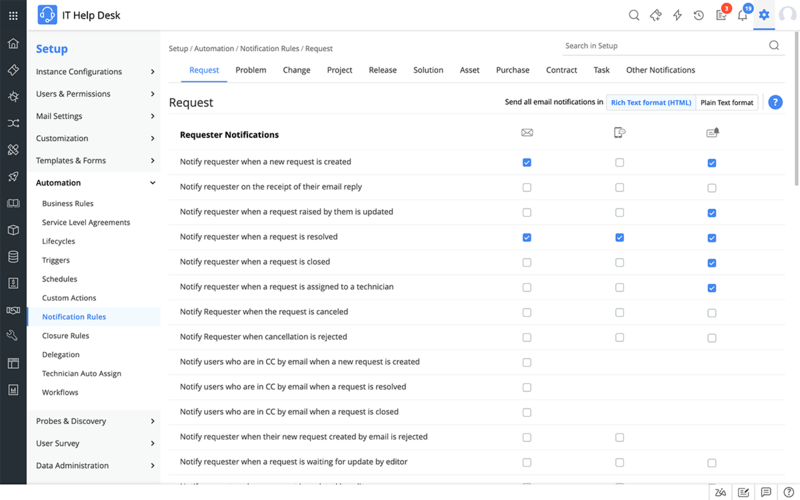 API integration within ServiceDesk Plus allows you to access and manage requests that have been created on other platforms. If you are migrating from another help desk platform to ServiceDesk Plus we would be delighted to help with the process. Business Rules allow you to initiate the automatic assignment of incidents to specific technicians, levels, priorities and categories. Business Rules, when set up correctly, could help you to automatically assign up to 70% of incidents being raised. Notification Rules allow you to send confirmation receipts to users and support engineers automatically. 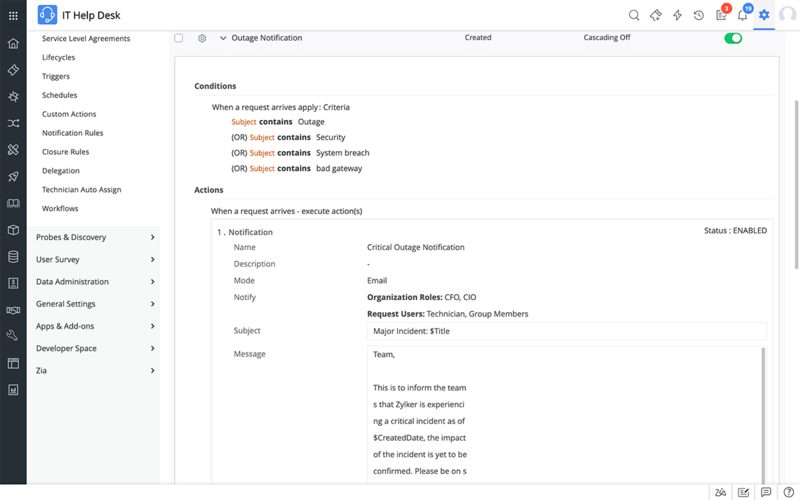 These automatic alerts can be sent out at request creation, when a change is made within a request or if the request is assigned to a team or technician. A notification can also be sent at the time of SLA violation. What good would a help desk solution be without robust reporting? 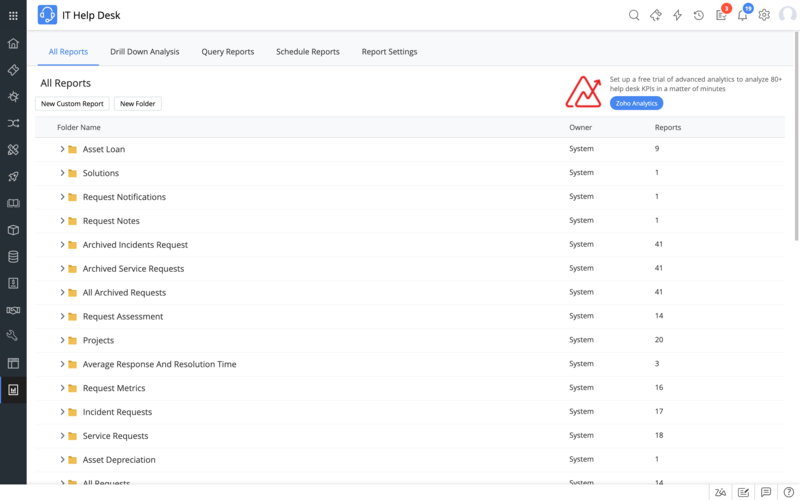 ServiceDesk Plus allows you to build and run reports on aspects such as IT Help Desk load, SLA violations, technician performance and much more. You can also run trend analysis reports for when deeper investigation is required on a particular issue. Want to know what your users think of your service? The User Survey feature within ServiceDesk Plus is a great way to receive user feedback and to improve the levels of service you provide as a team.